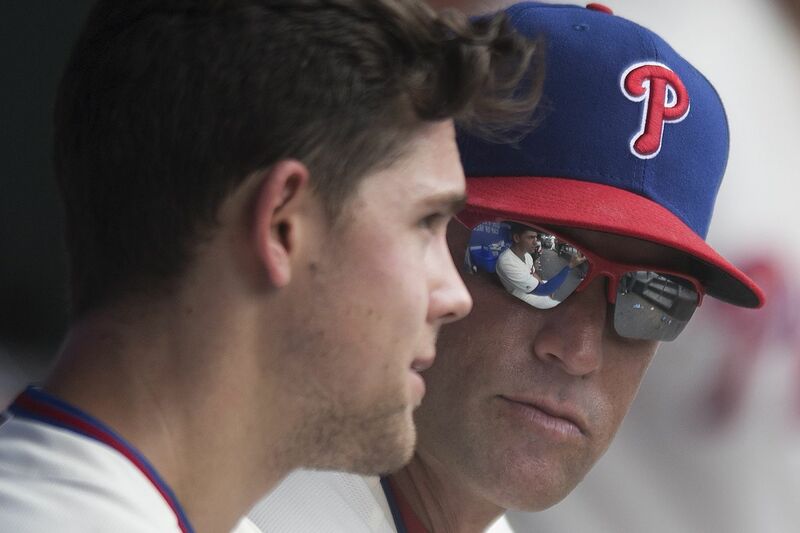 Gabe Kapler has a lot of solid pitching in the pipeline in the Phillies’ farm system. The Dodgers' starter for Tuesday's World Series Game 1 will be Clayton Kershaw, who was drafted by Los Angeles in 2006 and, in the 12 years since, has been utterly dominant: 2.39 ERA, three Cy Young Awards and seven all-star nods. The first player he'll face is the Red Sox's Mookie Betts. After being drafted by Boston in the fifth round in 2011, Betts has become one of Boston's most beloved and talented players. This season, he hit .346 with 30 stolen bases and 32 home runs. He's the odds-on favorite to win AL MVP. The rosters of both World Series teams are stacked with home-grown players who've been carefully developed and are making an impact at just the right moment — with the help of some crucial big-name free agents, of course. What does all this have to do with the Phillies? There are no better franchises to emulate than these two. The Dodgers are in the World Series for a second consecutive year and have made the playoffs the past six seasons. The Red Sox, who won the Series in 2013, are back in for the third straight year. Let's take a look at who's on deck in the Phillies system, position by position courtesy of Bob Brookover. Luis Garcia is the best shortstop prospect in the Phillies’ minor leagues. Luis Garcia is a player to watch. The 17-year-old posted a .921 OPS in the Gulf Coast League, prompting one scout to say "that's some way to start a professional career." Over at third, the Phillies have the option to develop veteran Carlos Santana — who, as Matt Breen writes, would probably get pretty good with an offseason of training at the hot corner — or look to one of their draft picks. Alec Bohm, who was the third overall pick this spring but struggled in low-A and rookie ball, is a name to watch. Brookover called him the third baseman of the future back in June. There are a couple captivating prospects at first: Zach Green, who was picked in the third round in 2012 and played high school baseball with Rhys Hoskins. And a bonus: He also plays third. And then there's Joey Meneses. He wasn't drafted by the Phillies, but ended up with them after amateur scouting director Johnny Almarez — who used to be with the Braves and scouted Meneses there — encouraged the club to grab Meneses when Atlanta released him. The 26-year-old finished as the International League player of the year. Not too bad. Here's Brookover's full analysis of the minor-league infield prospects. For three straight years, the Phillies used their highest draft picks on outfielders. How is that working out so far? In left field, 2017 first-round pick Adam Haseley played well for Reading. There's a chance he'll end up in the majors in left, especially if Hoskins ends up at first base. Bryan Minniti, the Phils' assistant GM, expects Haseley to easily jump to triple A in 2019. Mickey Moniak is the top prospect in center field, according to Brookover. He was the first overall pick in the 2016 draft, struggled through low-A Lakewood in 2017, and was placed at high-A Clearwater to open 2018. It didn't go so well. But Moniak, just 20 years old, redeemed himself in the final half of the season. Minniti says the Phils are still "very excited about him." One scout expects a breakout year. Here's a breakdown of all the top prospects in the outfield from Brookover. The Phillies added Wilson Ramos at the trade deadline to hold them over while rookie Jorge Alfaro got comfortable behind the plate. It's unlikely Ramos, a free agent, will stick around, so who's on deck if Alfaro struggles and Andrew Knapp continues in his growing pains? The top prospect is Rafael Marchan, a 19-year-old from Venezuela who played mostly for short-season A Williamsport. One scout thinks Marchan has "the best chance to be an impact catcher" among all the catching prospects in the Phillies system. Here's more on those catchers from Brookover. Sixto Sanchez remains the Phillies’ top pitching prospect. Here's where we get to the good stuff: The Phillies farm system is loaded with pitching prospects from top to bottom, according to Brookover. Sixto Sanchez can throw in the triple digits and has an incredible command of the strike zone despite being just 20. He was injured in 2018, and is missing the Arizona Fall League because of it, but fans can expect good things out of the most high-profile prospect in the organization. Adonis Medina's name came up when the Phillies were trying to make a move for Baltimore's Manny Machado. One scout says "he's going to be a big-leaguer" and has a ton of potential, perhaps in the bullpen. Which prospect has a "Chris Sale-like arm" according to one scout? Will Stewart, a 20th-round pick in 2015 who broke out in low-A Lakewood this year. "He's one of the best 20th-round picks you'll ever see," the scout said. Here's a look at all those prospects, plus the relievers you want to know. You keep hearing about Machado, Bryce Harper, and the rest of the marquee free agents due for a big payday this winter. But how much can the Phillies really spend? Scott Lauber broke it down in a recent edition of Extra Innings (not signed up? Fix that here). He found the Phillies will be flush with cash this winter — maybe not enough for both Machado and Harper, but enough for one of them and another starting pitcher — Lauber suggests the Diamondbacks' Patrick Corbin, the Yankees' J.A. Happ, and the Astros' Dallas Keuchel as names to watch. Breen thinks Harper's the favorite, mostly because of Machado's recent comments in which he said hustling out an infield grounder "is not my cup of tea." That attitude probably won't play well in South Philly. We'll soon find out if it's Machado, Harper or neither who ends up playing for the Phils next season. Players become free agents the day after the World Series, and can start signing offers five days later. That means it could start as early as Nov. 2 or as late as Nov. 5.